Tariffs are inundating the news, not least because they are the source of unprecedented tensions between allies and neighbors, the US and Canada. 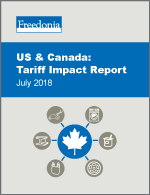 In this follow-up to Freedonia’s Impact Report: US Tariffs & Global Retaliations, Freedonia draws on its expertise with global markets and NAFTA to provide deeper insight into the specific impacts the trade war will have on companies and consumers on each side of the world’s longest unguarded border. This new white paper provides quick, easy-to-read summaries of how US tariffs and Canada’s retaliations will bring changes to 16 different US and Canadian industries.